I read Books of A Feather and I was surprised at how much I actually enjoyed this well thought out and "plausible" cozy mystery. This book was sent to me to review and on a side note here, I did not think I would enjoy it as much as I did. I foolishly thought this book may not be one I could easily read and understand but I was wrong it was very good and I was pleasantly engaged in the story. I thought that the characters in mystery were easy to relate to and more then well developed. I was surprised because I had tried to read this series before and struggled to get through it, after reading this book cover to cover I may go back and try again. 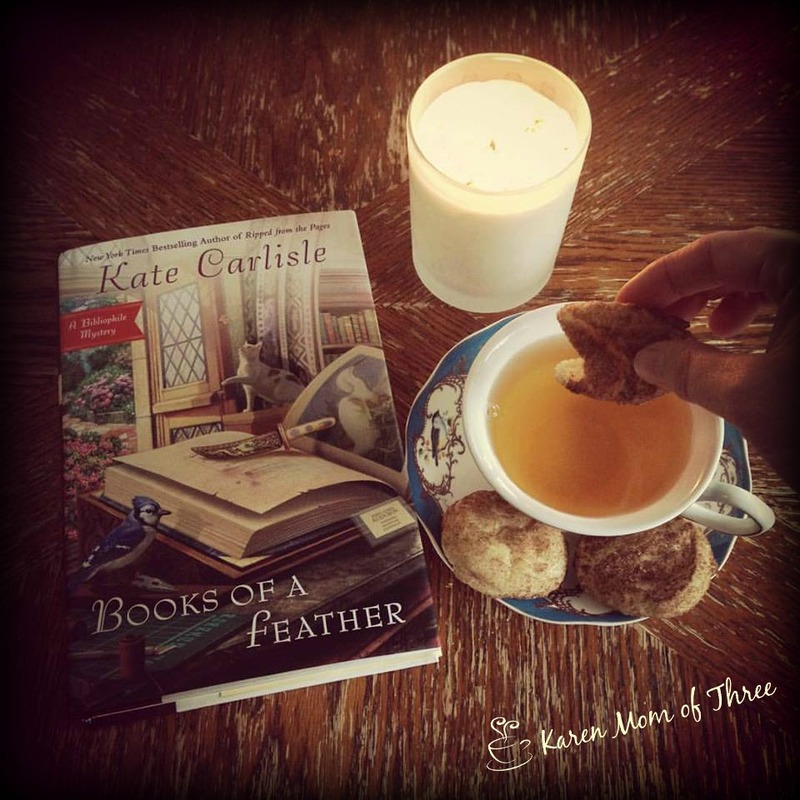 Kate Carlisle is a wonderful writer. "San Francisco book-restoration expert Brooklyn Wainwright s latest project is for the birds, but it may have her running for her life. . . . Brooklyn s friend Ian runs the Covington Library, which is hosting an exhibit featuring John James Audubon s massive masterpiece, "Birds of America," currently on loan from an Arab sheik. 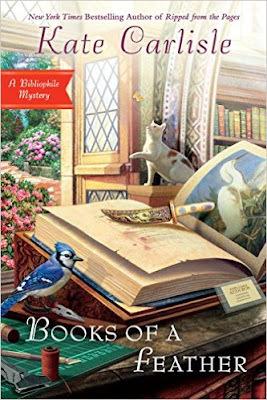 During the gala celebrating the book, she is approached by Jared Mulrooney, the president of the National Birdwatchers Society, who urgently needs Brooklyn's skilled hands to repair a less high-profile book of Audubon drawings that s fallen victim to spilled wine. At the same party, Brooklyn is flying high after she s asked to refurbish and appraise a rare copy of "Poor Richard s Almanac." 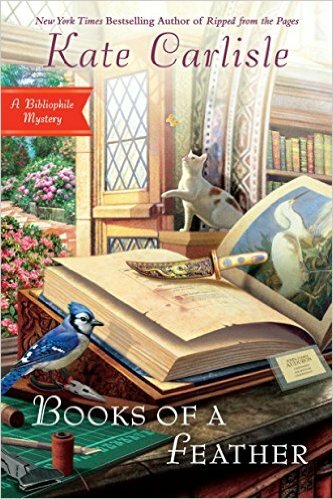 But everything runs afoul later that evening when Mulrooney s body is discovered in the library. Rumors fly about a motive for murder. Perhaps Mulrooney wanted to sink his claws into the pricey Audubon book, but Brooklyn believes the man died fighting off a daring thief. Soon more troubles ruffle Brooklyn s feathers. Her parents pop in for a visit with an unsavory friend in tow, and there s a strange man on her tail. With danger beginning to circle Brooklyn s every move, it s clear she must find answers before things really go south . . ."
Books of a Feather surprised me in a good way and made for an excellent read. It also paired well with my Snicker Doodle cookies and Trader Joe's Earl Grey Tea. To learn about how you can order this book from Amazon out June 7th please click here. 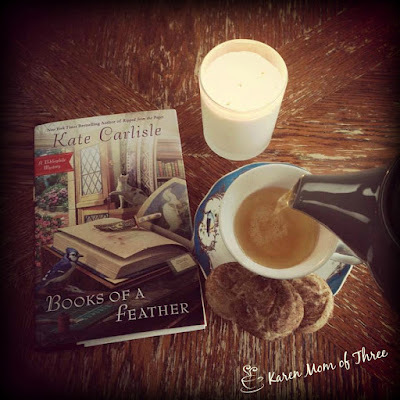 Learn more about this series and Kate Carlisle by clicking here.